Rave ladoo is one of my favorite sweets from my childhood.Making Rava ladoo in the microwave is really easy and quick.These ladoos tastes delicious and saves our lot of time and efforts. 1) Place rava in a microwave safe bowl and add melted ghee to it.. Mix well and place in microwave on high for 4 mins. (Time may vary depending on your Microwave). Keep stiring in between after every one minute..
2) When done, remove and allow it to cool in a wide plate (30 mins). 3) Once cool, add powdered sugar cardamom powder and nuts (if using) and mix well to remove lumps. I did'nt add nuts to rava ladoos. 4) Make small round balls with hand. 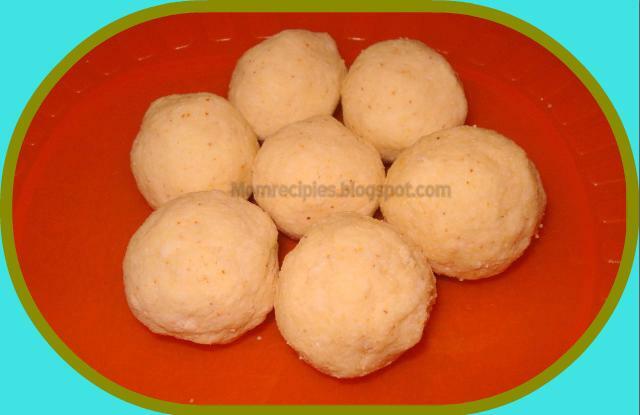 5) If they break easily or hard to make nice shaped ladoos then add 2-3 tbsp hot melted ghee and then make ladoos.